Skuli lives in the Old Hroldan Inn and is the son of Eydis. He works in his mother's inn where he serves food and drinks and makes up the beds. He will sometimes greet you with "This is the Old Hroldan Inn. Clean beds and strong drink." Skuli wears red colored child's clothes and a pair of shoes. He carries a key to his mother's inn, a selection of food and toys, and a small amount of gold. 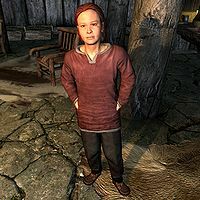 For a child, he speaks in a very mature way and exhibits a sense of responsibility far beyond the other children of Skyrim. If you point this out by saying he is very mature for his age he will respond in a somewhat angry fashion by saying "Watch your tongue, stranger. We don't take backtalk in this inn." He also seems to be rather confident in himself and he will often remind you that "If you drink too much, you're out. No drunks." He can also give you advice about learning magic, if you ask him, by saying "Magic? That's dangerous. You want to learn that, go to that College in Winterhold. They teach that stuff there." before remarking "Hey! I know. The Jarl's wizard could teach ya. He's lots closer." He isn't aware that his father is missing, despite catching his mother in lies about his whereabouts. If Eydis dies he will inherit the inn, but Leontius Salvius will take over as publican. He will comment on this by telling you that "My mother's dead, but I won't close the inn. I've hired Leontius to run things." Even though he is depicted as mature for his age, he uses the default children farewell dialogue instead of a more formal version, and also may lament that he is not allowed to stand on the furniture if he notices you doing so. Should both Leontius Salvius and Eydis die, Skuli will be sent to Honorhall Orphanage and be available for adoption if Hearthfire is installed. This page was last modified on 22 December 2014, at 08:36.